Competing magicians create illusions within a mysterious circus.The circus arrives without warning.No announcements precede it, no paper notices on downtown posts and billboards, no mentions or advertisements in local newspapers. It is simply there, when yesterday it was not.This is exactly the kind of book that I love… a bit of magic, a bit of mystery, a touch of competition and romance and heartbreak, all within a complex and beautifully-described setting which makes you wish you, too, could go to this circus. The atmosphere immerses you so that you find yourself thinking about it long after you set it down.The prose within this novel was beautiful. 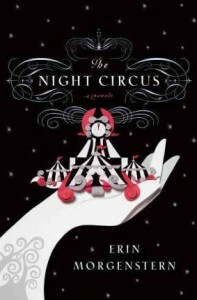 Yes, there are pages and pages of descriptions of the tents which pop up as by magic within the circus, but they’re so unique and intriguing and dream-like that you feel immersed within the author’s world.If there was ever a novel that was setting-centric, this is it. Though there is the element of the competition, the reader should not expect a plot-intense novel; instead this one takes place over a number of years with very few major plot points within those. Readers expecting a drawn-out, well-developed romance should also be warned, the romance grows mainly ‘offstage’ as it were, so we see them either uncertain or deeply in love, but not much in between. This isn’t about an intense Voldemort-vs.-Harry Potter battle, but a struggle to endure, and its resolution is one that is fairly predictable, especially considering the ample foreshadowing given. In a way it reminded me of The Devil in the White City, and I think fans of that book would enjoy this one as well.My one (very small) complaint was interspersing Bailey’s story within the others. Though I understand wanting the reader to attach themselves to him early on, when the two timelines became closer, it became more difficult to follow.Overall: Beautiful, poetic, descriptive, enchanting.